A Central Alberta based project is giving local farmers and agricultural producers the opportunity to further their education – all without needing to leave their communities. The project’s main topic of conversation? Climate solutions that can benefit Alberta farms and ranches. — Derek Leahy, director of Rural Routes. 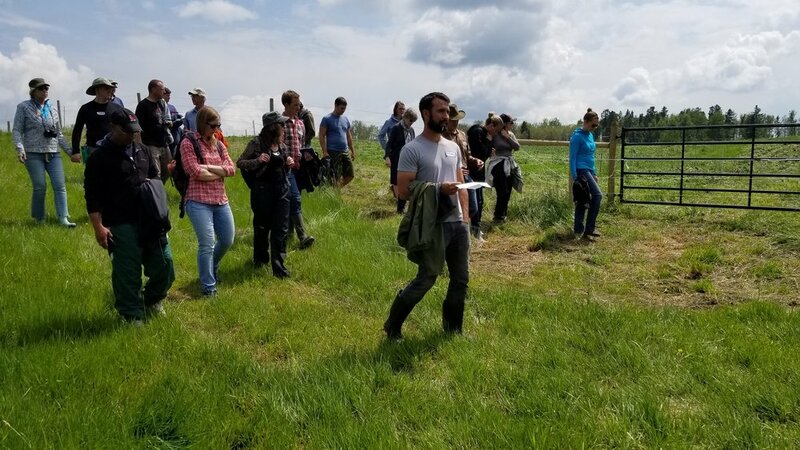 Rural Routes to Climate Solutions– a project with the Stettler Learning Centre– is using a hands-on approach to provide opportunities for agricultural producers to explore about the benefits of implementing climate solutions in their day-to-day business activities. Now a year into the project, Rural Routes facilitates workshops and field days, bringing in different experts and presenters in the climate solutions and agricultural space. Attendees also have the chance to talk one-on-one with presenters after the conclusion of the events. In addition, Leahy has found their podcast series is one of the best ways to disseminate information to producers across the province. Agriculture may be one of the sectors most impacted by a changing climate, affecting growing season length and harvest timing, pollinators and pests. On the other hand, agriculture could be a significant lever for reducing emissions, since it is a natural way to store carbon. According to Leahy, one of the most effective climate solution methods for Alberta farms is soil carbon sequestration – a process through which carbon dioxide is removed from the atmosphere and absorbed into the soil, decreasing the amount of greenhouse gases in the atmosphere. Agricultural producers can activate and maintain the process by minimizing soil disturbance through reduced tillage methods and not overgrazing pasture land. While there is an environmental payoff to implementing this method, soil carbon sequestration could also have economic benefits for Alberta producers. Another popular discussion topic at Rural Routes is on-farm solar and energy efficiency – adopting energy-efficient technologies that could have a long-term impact on the climate. Leahy said because both solar and wind are prevalent in Alberta, agricultural producers could harness those elements to minimize their environmental impact and streamline some of the costs associated with operating a ranch or farm. For example, large-scale dairy operations could install solar energy systems, which would make them less reliant on fluctuations in the energy market and result in a more efficient and cost-effective farm, said Leahy. For Leahy, providing producers with educational resources is one of the ways to empower rural communities, and begin to change the narrative surrounding farmers and the climate. He said while there are many agricultural organizations that talk about ecology, diversity and soil health, there are few that create conversations explicitly around climate solutions. Rural Routes provides that space. Currently, their primary audience is smaller-scale farmers, but Leahy said Rural Routes plans to engage more with the industry, talking with commodity groups and developing partnerships with some of the large-scale agricultural operations in Alberta. For more information on how to undertake your own energy efficiency project, check out the resources page. Many people talk about making the world a better place; Amanda Hall is doing it. Hall is the co-founder and CEO of Summit Nanotech, a company in Alberta using advances in nanotechnology to create and implement clean solutions for industrial processes. Hall is a geophysicist by trade, with eight years of experience in the oil and gas industry, four in the mining industry and an additional four spent in an industrial laboratory at a sugar refinery. Those experiences, coupled with her 12 years of post-secondary education, put her in a prime position to launch Summit Nanotech with co-founder Jason Hendrick 10 months ago. Summit Nanotech uses nanotechnology — quantum mechanical technology that deals with materials at the atomic level — to address some of the world’s most pressing energy and environmental concerns. Currently, their focus is on developing the greenest lithium-ion resource extraction method in the world. According to Hall, the demand for lithium is about to skyrocket. Their new extraction method can be used to create an inexpensive and sustainable source of lithium for batteries used in portable devices, mobile gadgets and electric vehicles — the driving force behind the demand. “Battery storage will play a huge part in having a renewable energy future,” said Hall. Traditionally, extracting lithium from brine water requires high energy and chemically intensive processes. Hall said they want to use nanoscience to perform the extraction process more gently and efficiently, to reduce environmental contaminants and greenhouse gases. “At the end of the day, our process is different from traditional extraction methods, because we use less energy, fewer chemicals, no fresh water and we have higher yield at the end, so our operation costs per tonne are better,” said Hall. Hall said while this project is still in the development phase, many companies are interested in their technology, which will mainly be provided as a clean extraction solution to mines who are already processing lithium. This technology can also be beneficial to oil and gas companies, said Hall, who is currently working with a few other companies in Alberta to map lithium resources in the province. Since brine water is often a by-product of pumped oil, lithium extraction can also function as a secondary revenue stream for oil and gas. In turn, these oil and gas companies can provide a resource for battery technology that supports renewable energy storage. Although less than a year old, Summit Nanotech is recognized as a leader in the space. Hall, identified as a top female innovator in Canada, was named a finalist in the Women in Cleantech Challenge in September 2018. Summit Nanotech was awarded $800,000 and the opportunity to work closely with advisors and researchers from Natural Resources Canada (NRCan) and MaRS, a Toronto-based business incubator. Once Summit Nanotech achieves sustainable lithium extraction, they plan to use the technology to go after other metal ions and work closely with water purification companies. For more information on how to undertake your own clean tech project, check out the resources page. Mountains, glacier-fed lakes, wildlife … and solar panels? Solar panels have been popping up on many Canmore homes over the last few years, thanks in part to Canmore’s Solar Incentive Program. Now in its fifth year, the program provides an opportunity for people in the community to invest in renewable energy by offering a financial incentive to residents and businesses to help offset the cost of purchasing and installing a solar system. Rissling Wynn said the program is often oversubscribed. This year, 25 people submitted applications. For many individuals though, the upfront capital is one of the major barriers to solar installation; the Canmore Solar Initiative is meant to help reduce that barrier. Even with the financial incentive, Rissling Wynn said they recognize a solar panel installation is a big economic decision, and families need to decide whether a solar system is the right fit for their home. But it’s an over-simplification to say that a solar panel system is too expensive as an investment for most homes. Depending on the size of the system, it takes eight to 10 years to completely recover the capital cost, but most get at least a portion of their bills covered within the first year. Moreover, installing a solar panel system on their home tends to have ripple effect — residents become increasing mindful about the amount of energy they use on a daily basis, like turning off lights and running the dishwasher during the day when the panels are generating power. By monitoring energy production versus household consumption, families can reduce energy costs by consuming power when the solar installation is producing energy. The solar energy investment doesn’t just benefit the homeowner. According to Rissling Wynn, the number of solar installers working in the valley has tripled since the initiative first started in Canmore, spurring the green economy and increasing employment opportunities. Further, the increase in solar installations around town have helped to debunk the myth that solar energy was not possible in the valley. A report, commissioned by the Town of Canmore to evaluate the solar potential of the community, found that rooftop geometry and design has significantly more impact on solar potential than mountain shading and location within the valley. This bodes well for new residential developments in the community. It’s not just residents and local businesses looking for opportunities to offset their energy usage. Within the next two years, Canmore will add five new solar panel installations to their municipal buildings, on top of the systems currently in operation, which include the solar photovoltaic systems installed on the roofs of the Civic Centre and Waste Management Centre. The town is also looking for opportunities for ground-mounted solar to help offset corporate energy usage. “We are recognizing that the grid needs to be maintained, and renewable energy needs to be a part of that mix,” said Rissling Wynn. For more information on how to undertake your own renewables project, check out the resources page. Captain Nichola Goddard School in northwest Calgary was built for grades 5 to 9 as a community school, meaning that none of its students had to bus in from outside its catchment area. But despite the fact that nearly all the students lived within two kilometers, many of them were still being driven by their parents. Since the school wasn’t built with motor traffic in mind, it was plagued with congestion, unsafe driving, idling cars and stressed students late for class. A group of students and teachers at the school decided to change the way students got there. From this, the Green Commuting Challenge was born. The program incentivized walking and cycling for students. It combines teaching students about their ecological footprint with a reward system for those who walk or bike to and from school, including prizes, such as pizza and movie tickets. The challenge makes it clear that everyone can participate and aim for a reward, not just the most devoted human-powered commuters. The program also makes it easier for younger students to participate, with “Green Commuting Hubs” – places around the community where students meet to walk together under the supervision of a Grade 9 student. By having older students direct and promote the project, the team was able to take advantage of relationships that already existed between students. “As teachers, we can say things until we’re blue in the face, but students won’t make lifestyle changes because of what we tell them. They’ll make lifestyle changes because of what their peers tell them,” said Debbie Rheinstein, one of the teachers behind the program. The program is wildly successful. Five years after its inception, Rheinstein saw students approaching staff at the beginning of the year asking about being involved before the Challenge was even advertised to them. It had become a part of the student culture at Nichola Goddard. Much of the Green Commuting Challenge is administered by a group of Grade 9 students called the Green Commuting Leadership Team. In addition to planning, participating in and presenting the program at the Calgary Mayor’s Environment Expo, these students are instrumental in spreading the culture of environmentalism throughout the school. Students grew the program among their peers and also among their teachers. They started, “car-free days,” to challenge teachers to join the Green Community Challenge. Rheinstein jokes the teachers felt peer-pressured by the students. This initiative was successful because of the engagement and leadership of the students at the school. They took a small program and grew it into school-wide action, showcasing the tremendous impact students can have on the community around them. This story was written in collaboration with The Green Medium. For more information on education projects and opportunities in Alberta, see our resources page. Chris Doornbos has always been interested in energy systems, but it was hard to find opportunities in clean energy for geologists like him. Until he started thinking about lithium. Lithium – soft, silvery-white alkali metal, similar to potassium or sodium – is one of the main components of batteries, and a crucial resource for the energy storage industry. In 2014, Chris began looking for lithium projects, first in South America, which supplies about 75 per cent of the world’s lithium, as well as in the U.S. and Australia. Then, he came across a report from the Government of Alberta about lithium, and discovered the availability of an unexplored, underappreciated asset right in his own backyard. The Leduc Formation was first explored for oil and gas in the 1940s and led to the oil rush in central Alberta. Over the past 70 years, more than 3,000 wells have been drilled in the area. Because of the existing wells – as well as collaborative relationships with other companies working in Leduc Formation reservoirs – no further drilling or land disturbance has been needed for E3 Metals to develop their lithium project. “As a mineral company, the biggest expense you have is drilling and we haven’t needed to do that,” said Doornbos. Based on their sampling, the company estimates there is 6.7 million tonnes of lithium in the reservoirs of the Leduc Formation, making it one of the largest sources of lithium in the world. The standard process for extracting and producing lithium relies on huge evaporation ponds, taking 18 to 24 months to concentrate lithium to a point where it can be refined. What makes E3 Metals unique is that, using a chemical filter process called Ion Exchange, they have developed a method to concentrate lithium in only three hours. Not only is it fast, it is also likely inexpensive compared to the evaporation process, and removes 99 per cent of the impurities found in lithium brine. In addition to speed, the lithium brine extracted is hot, and could be used to produce geothermal power to run the process. E3 Metals hopes to make their facility net-zero, and in doing so create the an environmentally friendly source of lithium. “We have the potential to be a near zero-greenhouse-gas lithium producer,” said Doornbos. The company is still in the development stage, to date achieving a 20x concentration in lithium with their process. They hope to soon have a demonstration of this process and then plan to build a pilot plant facility in the field this year. With an increase in electric vehicles and energy storage, global lithium demand is expected to triple by 2025. Learn more about E3 Metals Corp here. At Hazeldean Elementary School in Edmonton, Grade 5 students created an energy efficiency program through the Innovative Elementary Program. The students were able reduce the energy consumption and cost of lighting at their school and teach other students and teachers about energy efficiency. “Elementary kids are often overlooked about their ability to make changes and advocate to the things that they care about,” said Grade 5 teacher James Stuart, who manages the Innovate Elementary Program at Hazeldean. This project is one of many ways students have demonstrated the impact they can have in their school community. The first step was to learn about electricity, energy efficiency and light bulbs. Stuart along with some energy experts taught the students about different kinds of light bulbs and how much energy is used for each. They also learned about electricity, how it is produced in Alberta and the environmental impacts of the different types of production. Next, students used their new knowledge to calculate their school’s electricity consumption by determining the types and consumption of light bulbs, and the number of each type of bulb throughout the building. From there, they monitored how many lights were on in each classroom, checking in at various times of the day to determine when classes were in session, when they were empty, and at the end of the day. After collecting data, the students had to decide how they would present it. To make their information accessible to everyone, including the youngest students, they used made posters with photos and simple info boxes to teach their peers about the energy consumption of objects in their classroom. They included images of smart boards, desktop computers and lights with the amount of energy each consumed. The posters were distributed throughout the school. The students also decided to create a contest for the classroom who was able to reduce their lighting energy consumption by the greatest amount. Using the information they had about each room’s energy consumption, they created a poster for each classroom showing its energy consumption. They continued to monitor the energy consumption of each classroom at random times until the end of the contest, with the winners earning hot chocolate made from the students’ self-made solar oven. At the end of the lighting audit the Grade 5 group presented their findings during the school’s morning announcements. Over that time, they saw a reduction of 40 kWh. That is the equivalent of a 43-inch’ plasma TV running 32 hours a week for a month. Through this project the students in Stuart’s Grade 5 classroom educated themselves, creatively engaged their school on the topic of energy efficiency, and were able to make changes in their school’s lighting electricity consumption. When you step into the Brookfield Symons Gate Passive House in Calgary, Alta., the front door closes with a sound that makes you feel like you have just entered an airtight vault. And then you are greeted by the sounds of silence. The sounds of the outside world vanish within the heavily insulated walls of this gorgeous, 2,400 square home. You don’t even hear the hum of a fan, because there’s no furnace. The walls are solid cross-laminated wood, the basement floor feels like it’s heated, and the windows are triple-glazed energy-efficient Austrian models that tilt and swing open. “Passive house takes advantage of one of the most abundant resources that Alberta has, which is the sun,” says Doug Owens, senior director of strategic development and regulatory affairs with Brookfield Residential, North America’s sixth largest developer. This ultra-efficient house uses 90 per cent less energy than a conventional home. An eight-kilowatt solar system on the roof provides nearly all of the energy required to power and heat the home. It has no gas connection. “And the giant window in the middle is actually the furnace for the house,” says Owens, pointing to the massive, south-facing window that lets the passive solar heat stream in. The window’s R7-rated triple glazing helps trap the warmth inside. “Air tightness is critical,” says Owens, but even though this home is rated as super airtight–just 0.5 air exchanges per hour–it gets plenty of fresh, clean, filtered air. Instead of a furnace, the home has a heat recovery ventilator—a fancy name for an air exchange system that recovers 86 per cent of the heat from the outgoing air. Built into the ventilation system is a 3,000-watt electric heater—but it only kicks in on the coldest, darkest days of winter. This Zender ventilator is actually called an energy recovery ventilator because it also has an active bypass system that stops scavenging warm air on hot summer days, helping cool the home. When you head downstairs, most people ask if the floor is heated—it has eight inches of insulation beneath it and it feels quite warm. The mechanical room is nearly empty, with just the air exchange system and a super energy efficient electric water heater. Sixteen-inch walls – No furnace! This minimalistic system is made possible thanks to out-of-this-world levels of insulation in the home. Add the thickly insulated basement floor, and you have an unbroken envelope of insulation blanketing the home. Brookfield viewed the Symons Passive House as a chance to innovate. You could use thick double-stud walls for the insulation, but Dean Guidolin (design manager at Brookfield) says they opted to use solid cross-laminated timber (CLT). The custom walls were built in a special panelization factory in Germany. Matt Arsenault, president of Sawbuck Builders (the company that assembled this unique home) describes the CLT system in detail. “It is four inches thick timber that’s been glued and laminated together and it creates the structure of the wall,” says Arsenault. Then add 9.5 inches of solid wood fiber insulation and another 1.5-inch layer of wood-based insulation and you have 16-inch thick walls that lose almost no heat. Arsenault says the pre-built walls, floors, and ceilings came in a sea container along with some IKEA-like instructions in German to put it all together. “I learned a lot about how the energy loss happens in a typical house, through air leakage and things like that. And this method of construction really eliminates a lot of the opportunity for outside cold air to come in and cool down the house,” says Arsenault. Owens says Brookfield didn’t aim for an inexpensive passive home, but rather chose to explore new systems and build a truly great home. “I was just thrilled to see people walk in, and when they open it open the door their jaw drops at how beautiful the home is,” says Owens. Before tackling the project, Owens himself took a course in passive house building. He believes code changes are coming, and homes may have to be net-zero-ready as early as 2030. He wants to keep Brookfield ahead of the trend. Owens says public attitudes are also pushing the shift. “I think people are starting to think about the environment more.” Where yesterday’s customers may have been fixated on granite counters and hardwood floors, many home buyers today have questions about energy efficiency. Brookfield’s first passive home was not cheap to build, but Owens says they learned a lot. He believes the move toward prefabrication will help ease labour shortages, increase quality, and meet higher efficiency standards. “I think that’s really going to drive down prices and then they will become commonplace,” says Owens. Brookfield clearly aims to be an active force in passive technology. This story was originally published on Green Energy Futures. Learn more about Brookfield’s passive house, here. For more information on energy efficiency in Alberta, see our resources page. 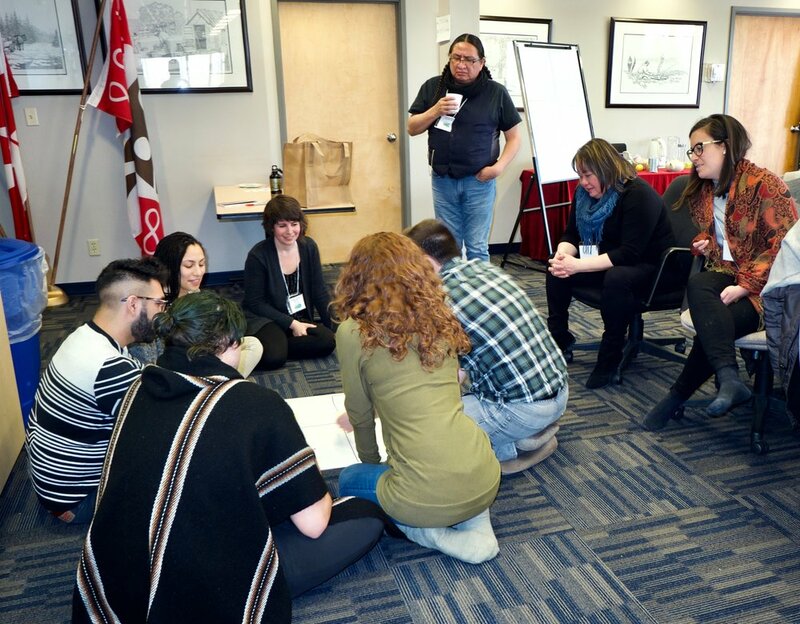 Project Footprint is a program aimed at young newcomers to Canada, offering environmental programming at a school and housing development in Calgary. The program, run by the Calgary Immigrant Women's Association (CIWA), combines its programming and expertise to reach girls aged nine to 13 with environmental sustainability content. 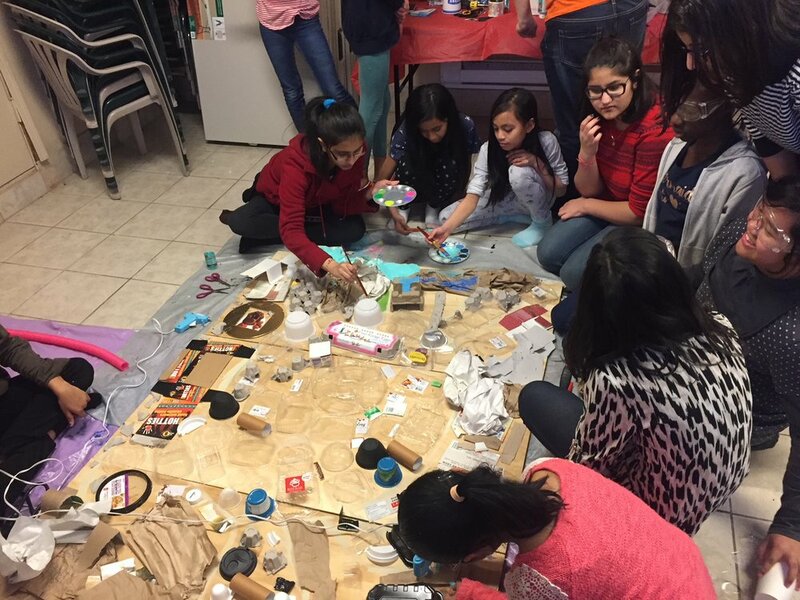 Project Footprint, now in its third year, came about as a way to encourage and engage young immigrant girls in the global conversation about the environment and climate change, said Project Footprint’s program coordinator Amarjit Parmar. “We wanted to start the program up to get the conversation going, and develop some leadership skills in the girls to let them be global ambassadors,” said Parmar. There are two parts to the program: regular weekly events with guest speakers, which focus on a wide range of environmental and sustainability topics. In addition, a mentorship program is held twice a month and connects the Project Footprint participants with older students, who work together to create and run sustainability projects. Project Footprint participants also share their work with their community and peers. At CIWA’s annual youth forum the girls taught participants how to make reusable plastic wrap replacement using beeswax, coconut oil and fabric. Another year they flexed their green thumbs, teaching participants about gardening. The team mentorship projects vary each year depending on the interests of the participants. In the past, the young girls have run recycling programs, worked to reduce their plastic waste, and started an upcycling project to turn used clothing into new items. The creativity and passion put into their projects may be fueled by the freedom and ownership they have. Parmar said the projects are based entirely on what the girls want to do, from conception to execution, while the youth mentors are there to support the implementation of the ideas and the creativity.